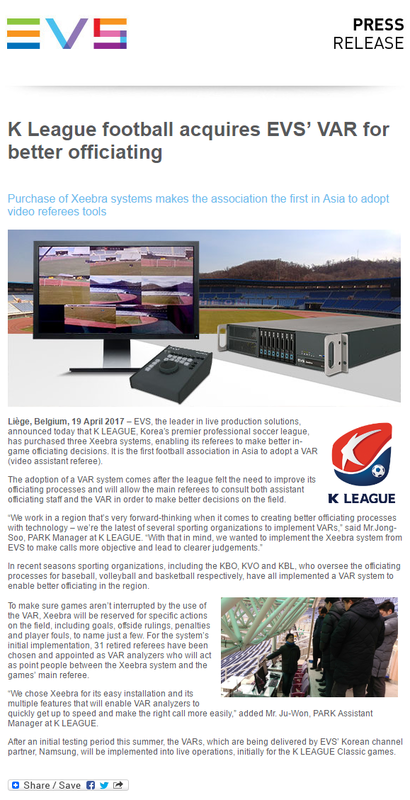 K League football acquires EVS’ VAR for better officiating > Case Study | Namsung Traders Co., Ltd.
Liège, Belgium, 19 April 2017 – EVS, the leader in live production solutions, announced today that K LEAGUE, Korea’s premier professional soccer league, has purchased three Xeebra systems, enabling its referees to make better in-game officiating decisions. It is the first football association in Asia to adopt a VAR (video assistant referee). The adoption of a VAR system comes after the league felt the need to improve its officiating processes and will allow the main referees to consult both assistant officiating staff and the VAR in order to make better decisions on the field.